I arranged this small sampling of items on my steel block to summarize my design direction...completely scattered! I'm having tons of fun creating pieces that have been bouncing around in my mind. They all relate to my 3 different collections, and, maybe in some way, relate to each other as well. 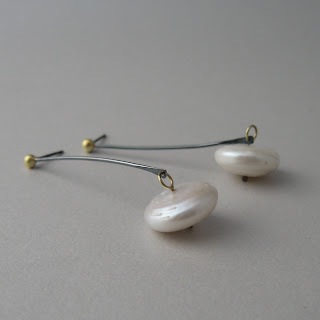 I just listed this pair of earrings in my Etsy shop the other day. I'm in LOVE with these pearls I picked up while in Florida. Lots of pearl items with oxidized sterling and 18k gold on the way!! I love pearls. Your teasing us....I can't wait to see what you create next. I love pearls also and I love those earrings.